The 2016 Nebraska Archaeology Month Poster commemorates the 50th Anniversary of the National Historic Preservation Act, which was signed into law on October 15, 1966 by President Lyndon B. Johnson. The NHPA established the legal framework and incentives to preserve historic buildings, landscapes, and archaeology all around Nebraska and the nation. The ongoing programs and protections established by the Act include the National Register of Historic Places, the Section 106 Review Process, the Advisory Council on Historic Preservation, and the Historic Preservation Fund. Of the programs established by the Act, the National Register of Historic Places (NRHP) is the perhaps best known. In an effort to recognize the Nation’s historic places worthy of preservation, this official list was authorized by the National Historic Preservation Act on October 15, 1966. The first properties listed on the NRHP included all previously designated National Historic Landmarks, including several of Nebraska’s most noteworthy archaeological sites. In order to highlight Nebraska Archaeology while making a connection to the NHPA, it was decided that one of these sites would become the focus of the 2016 poster. After going through photo collections housed at the Nebraska State Historical Society, a 1932 photo taken of Signal Butte by Clarence Lorenzo Dow, then a geography student at the University of Nebraska – Lincoln, was chosen to become the image for Nebraska Archaeology Month 2016. South side of Signal Butte [Nebraska State Historical Society Archeology 25SF1-51]. Photo by C.L. Dow. Located in Scotts Bluff County, Signal Butte has been considered to be one of Nebraska’s most important archaeological sites, and was designated as a National Historic Landmark on January 20, 1961. Capped with a thick mantle of gravel and windblown soil, three distinct cultural horizons were found to be located on the butte, with the two deepest levels dating between 5,000 and 1,500 years ago. Initial excavations at Signal Butte took place in 1931-1932 by William Duncan Strong (Smithsonian Bureau of American Ethnology) along with an University of Nebraska Archeological Survey field party led by Waldo R. Wedel. The original photo taken by Dow shows 1932 field crew working on top of the butte, with their vehicles below. Archaeologists, including Wesley L. Bliss and John L. Champe, returned to the butte in the late 1940s and 1950s in order to further investigate the site’s nature and stratigraphy. It was determined to have likely served as a seasonal hunting camp for its inhabitants as well as a processing area. The site is also notable in the history of archaeology itself, having been one of the first sites to be dated using the radiocarbon method. Besides being an incredible archaeological site, Signal Butte also has special ties to the Nebraska Association of Professional Archaeologists (NAPA), being the image found on the William Duncan Strong Award plaques as well as having been the subject of the Association’s first logo! 1966 National Register of Historic Places, Signal Butte (25SF1), Scotts Bluff County, Nebraska. National Register #66000452. Beginning of archeological survey near park entrance. 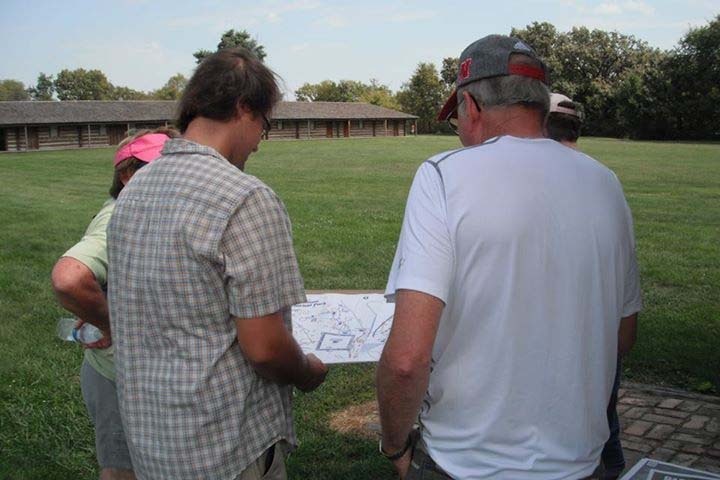 Recently, Nebraska State Historical Society archeologists worked with the Nebraska Game and Parks (NGPC) to conduct a pedestrian survey at Rock Creek Station, a stage and Pony Express station established in 1857 near present day Fairbury, Nebraska. In 1980, the NGPC developed the site into a state historical park, encompassing the locations of the road ranches that sold supplies and other services to emigrants in the mid-nineteenth century, as well as a segment of Oregon and California Trail ruts. Archeological excavations conducted at the time the park was established provided information that allowed for accurate reconstruction of many of the stations’ structures. These reconstructed buildings along with artifacts discovered during the 1980-1981 excavations remain on display at the park. Survey crew member Jason Tonsfeldt (NGPC) examining a reconstructed East Ranch building. Upcoming plans for a prescribed burn prompted the current archeological survey of the park’s 350 acres. The burn, part of an oak woodland restoration project and intended to help control the spread of invasive plants, is not expected to affect known archeological sites at the park. However, the proposed burn provided a good opportunity to conduct an inventory of archeological resources at the park, both through a pre-burn survey with the existing vegetation, as well as a survey following the prescribed fires. This post-burn survey, planned for late-April, is expected to take advantage of the greater visibility afforded by the fires via the removal of vegetation, possibly revealing additional unrecorded archeological features and sites. Data gathered during these inventory surveys will help NGPC staff plan future activities within the park in a way that ensures important archeological sites are not damaged by continued development. The data from these surveys also contributes to a more robust interpretation of Nebraska history within the park boundaries, as well as a greater understanding of past occupations in the state as a whole. To date, the survey has led to the discovery of several previously unknown sites, both prehistoric and historic, as well as the recordation of graves located on the property. To get a closer look at the pre-burn archeological survey, be sure to scroll through the photos below! 1980 A Preliminary Report on the Results of the 1980 Archeological Investigations at Rock Creek Station State Historical Park, Nebraska. Nebraska State Historical Society. 1982 The 1981 Archeological Investigations at Rock Creek Station State Historical Park, Nebraska: A Preliminary Report on the Results of the Second Season of Excavations. Nebraska State Historical Society. NSHS Archeologist Rob Bozell and Game and Parks staff Jim Domeier and Bob Hanover discuss finds along the creek, including bison remains and clay drain tile fragments. Rock Creek Station Superintendent Jeff Bargar (center) points out various park features while surveying near the trail ruts. Bargar, Domeier, and Bozell survey near the reconstructed West Ranch. Survey crew members mark down possible cultural cultural features, including depressions and a possible washed-out dugout after emerging from the timber near the East Ranch (pictured left to right: Bob Hanover, Jim Domeier, Rick Bell, Rob Bozell, and Jeff Bargar). Crew surveys near the southeastern edge of the park. Crew shot from Rock Creek with West Ranch in background. From left: Nic Fogerty (NSHS), Rick Bell (NGPC), Jeff Bargar (NGPC), Katie Paitz (NSHS), and Nikki Krause (NGPC). Bob Hanover and Jason Tonsfeldt (NGPC) in background. View from East Ranch to West Ranch. Crew surveying rock face for cultural features (petroglyphs). Most inscriptions consist of 20th century graffiti (as pictured), but some of the observed carvings may be attributed to older groups. Photos courtesy of Katie Paitz and Rob Bozell (NSHS). One of the big headlines of Nebraska Archeology in 2015 was the relocation of the Archeology Offices and Collections of the Nebraska State Historical Society to a newly constructed facility in North Lincoln. This building, known as the ‘5050 Building’ because of its address at 5050 N. 32nd Street, is located approximately 5 minutes south of Interstate 80. As those familiar with the NSHS Archeology Division know, staff offices and lab space have been found at a several locations in recent years, including the 3rd floor of the Lincoln’s Children Museum, the 3rd floor of the Nebraska History Museum, and most recently near S. 14th and Old Cheney in a temporary space, as they awaited the completion of this newest facility. In addition, collections had previously been housed in a less than optimal environment not suitable for long-term storage. The new 5050 Building addresses these issues, providing permanent offices for staff, ample lab space, and modern collection storage facilities complete with compact storage shelving. The new building also includes a large collection storage space for the NSHS Government Records, which will be relocated from the K Street facility in Lincoln later this year, along with the office of the State Archivist. The 5050 Building is open during regular state office hours. However, the doors remain locked throughout the week, so visits are best coordinated with Division Staff. Students and professional archeologists who would like to access divisional records and collections in the course of cultural resource management or scholarly research should contact Trisha Nelson at trisha.nelson@nebraska.gov. For more information, visit nebraskahistory.org! Whether at an Archaeology Month event or at your local library, you may have seen a copy of the 2014-2015 Nebraska Archaeology Month poster. Posters are the primary means for promoting a state’s archaeology month program, inviting citizens to participate in and learn more about their local archaeology. While a general theme of Celebrate Nebraska Archaeology has guided Nebraska Archaeology Month over the last couple years, our 2014-2015 poster titled ‘Passages Through Time’ was more specifically focused on the archaeology of Western migration and Nebraska’s recent settlement. The poster’s intent is to emphasize the various methods of investigating the past used by Nebraska archaeologists today, including traditional excavation and artifact analysis as well as modern survey methods and remote sensing techniques. Combined, archaeologists are discovering new aspects of the archaeological record that have long gone unnoticed. Designed by Graphic Designer Erin Colonna, the 2014-2015 poster centers around an image created from Light Detection and Ranging (LiDAR) data showing wagon ruts and the remains of Alkali Station, a major trail facility used by travelers on the Oregon and California trails, the Pony Express, the transcontinental telegraph, and the frontier army. In 2012, this site, located near Ogallala, became the focus of the National Park Service’s Archaeological Prospection Workshop, which is dedicated to the use of geophysical, aerial photography, and other remote sensing methods as they apply to the identification, evaluation, conservation, and protection of archaeological resources around the U.S. Using collected LiDAR data, a digital elevation model (DEM) of the area was created as shown, depicting a 3D representation of the ground surface with any objects or vegetation removed. The images appearing in the top right and bottom left of the poster feature Oregon Trail related collections at Scotts Bluff National Monument in Nebraska. Artifacts can tell us much about the people who left such materials behind, including where they came from, what activities they were engaged in, and even when they passed through. For the collections from Scotts Bluff, we can learn about the diverse group of people including Native Americans and emigrants on the Oregon, California and Mormon Trails who used the landmark for travel, camping, settlement, and more! Finally, the image in the bottom center of the poster shows the systematic metal detection survey of an 1865 battle near Cedar Creek on the Overland Trail. This site, believed to the location of the Rush Creek battle of the American Indian Wars, was discovered in 2008 by a group of students in the University of Nebraska – Lincoln’s Summer Field School in Archaeology, led by Dr. Doug Scott and Dr. Peter Bleed. In 2009, the researchers and 10 additional students further explored the site via a metal detector survey, finding more than 225 artifacts that helped to define the site, which was listed on the National Register of Historic Places in 2011. Although metal detectors have not always been positively associated with archaeological sites, the use of metal detectors as an archaeological tool has increased considerably since the 1980s, particularly at historic battlefields such as Rush Creek. These surveys have demonstrated that nearly any site containing metal artifacts can benefit from the use of metal detectors (Connor and Scott 1998). Having highlighted a very important period in Nebraska History and presented a number of the methods available for archaeological research, the 2014-2015 NAM Poster still only covered a very small portion of the past in Nebraska. In 2016, we are hoping to depict another aspect of Nebraska Archaeology and we need your help to come up with a new concept! Submit any ideas you may have for our next Nebraska Archaeology Month poster– share your favorite sites, photos, and/or themes with us by sending an email to NebraskaArchaeologyMonth@gmail.com so we can decide where to focus next. Otherwise stay tuned as we unveil the poster in the New Year! The archaeological community has again lost a great archaeologist and friend this year with the passing of Gayle F. Carlson. He will be greatly missed. Gayle F. Carlson passed away in Lincoln Nebraska on November 15, 2015 and lived most of his life in Nebraska. Following service in the U.S. Navy, he received his B.A. and M.A. degrees from the University of Nebraska-Lincoln. In 1967 Gayle began employment at the Nebraska State Historical Society as its Highway Archeologist. Gayle remained at the Society serving as Research Archeologist and State Archeologist until his retirement in 2011. Carlson’s depth and breadth of archeological research in Nebraska and surrounding states was impressive. Although he is known for work in many facets of archeology, his efforts with the early settlement period is particularly notable. He directed excavations, studied collections from, and wrote technical reports and published articles and books on many important sites such as Ft. Atkinson, Ft. Robinson, Rock Creek Station, Engineer Cantonment, and Ft. Sully. These endeavors have not only contributed significantly to material culture studies of Great Plains settlement and military frontier complexes, but also to architecturally and historically accurate reconstructions such as those of the Cheyenne Outbreak and 1887 Adobe Barracks at Ft. Robinson; the Barracks, Powder Magazine, and Council House at Fort Atkinson; and buildings at Rock Creek Station. In the course of working on historic period projects, Gayle became particularly well-known for his detailed yet careful and conservative use of archival information such as maps, journals, diaries, records, newspapers, and photographs. Carlson also has made lasting and significant contributions to a clearer understanding of Native American archeology from 8000 years ago until the 1800s. While any list of Carlson projects and publications would be rich, diverse, and quite lengthy, his contributions to Nebraska archeology are even more far-ranging through the impact he made on his many professional friends and colleagues. Gayle was the voice of experience and widely known as the ‘go-to guy’ on anything involving Nebraska archeology. He warmly and enthusiastically welcomed questions and discussions from students and archeologists young and old on topics ranging from theory to “what kind of arrowhead is this?” He was far more patient than most of his colleagues when asked by curious members of the general public visiting an excavation; “How do you know where to dig?” “How much is this stuff worth?” or “What tribe of Indians lived here?” Finally, his knowledge of the history and oral tradition of Nebraska archeology as a profession, was encyclopedic. Nebraska archeologists, students, and the interested public are all fortunate for the life and career of Gayle Carlson. It resulted in a vastly richer and more interesting understanding of Nebraska’s archeological record, than had he chosen a different career path. Gayle received NAPA’s William Duncan Strong Award in 2013. Pictured here with Rob Bozell and Cynthia Wiley. Gayle with the Duck Creek crew in 2007. It’s a wrap for Archaeology Month 2015! Congratulations on celebrating another successful Nebraska Archaeology Month! This really is a statewide effort and the energy and time contributed is appreciated! 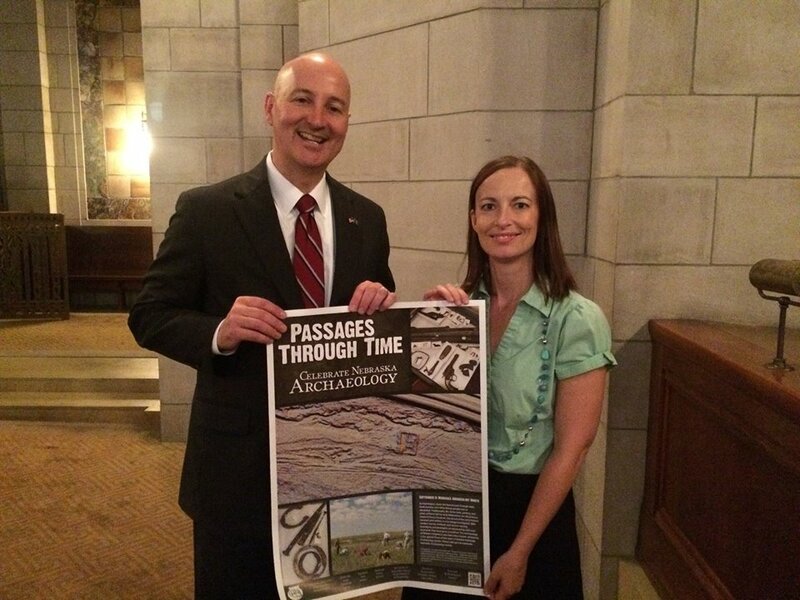 Governor Pete Ricketts kicked off this year’s celebration on August 12 as he proclaimed September to be Nebraska Archaeology Month 2015! Representatives from the Nebraska State Historical Society’s Highway Archeology Program, the National Park Service’s Midwest Archeological Center, and the Nebraska State Historic Preservation Office attended the proclamation and presented Governor Ricketts with a copy of the Nebraska Archaeology Month Poster. The Nebraska Archaeological Society (NAS) put together another successful Nebraska Artifact Show at the Seward County Fairgrounds. Once again, federal and state archaeologists were present at booths with free information on archaeology and educational opportunities for children. Phil Geib, an archaeologist with the Nebraska State Historic Preservation Office, joined other flintknappers in demonstrating how people created various chipped stone tools. The NAS also awarded two memorial scholarships to local university students studying archaeology! Planned events began in earnest at the beginning of September and filled the month with opportunities to learn about archeology. A special shout-out to Rob Bozell, Highway Archeology Program Manager at the Nebraska State Historical Society (NSHS), who headlined SIX different events! The archaeological community is grateful for the time commitment that Rob made and his dedication to furthering the archaeological interests of Nebraskans. Also, kudos to Courtney Ziska, an archaeologist with the NSHS Highway Archeology Division, for her work in securing multiple grant and funding sources to help defray the costs of speakers’ travels in the state and other event expenses. Courtney has also worked to put together nebraskaarchaeology.org, which has enabled the Nebraska Association of Professional Archeologists to more effectively communicate events, publications, and other information related to Nebraska Archaeology and the celebration of Archaeology Month. Many other people worked hard to make this month a success, and the space here is not sufficient to individually thank them all, so a HUGE thanks to everyone who participated in this year’s Archaeology Month by sponsoring and setting up events, presenting about archaeology, and getting the word out to others – this year’s success is yours! Of course, a special thanks also goes to our financial sponsors: Humanities Nebraska, the Nebraska State Historical Society Foundation, the Nebraska State Historic Preservation Office, the Nebraska State Historical Society Highway Archeology Program, the Nebraska Park Service’s Midwest Archeological Center, and the Nebraska Archaeological Society. Nebraska Archaeology Month would be impossible without your contributions! After another successful year, it’s time to look ahead to September 2016. Let’s keep the momentum going! 2016 promises to be an unusually busy year for archaeologists in Nebraska, as Lincoln organizes the 74th Annual Plains Anthropological Conference in October, the National Park Service celebrates their Centennial, and Nebraska begins its celebration for its Sesquicentennial in 2017! With so much happening across the state, the Archaeology Month Committee will be looking for help in putting on another great month’s worth of events in 2016. Fresh faces are needed to assist with tracking event demographics, writing press releases, organizing events… any sort of participation in the planning of Archaeology Month is welcome! If you are interested in helping out, please send an email to nebraskaarchaeologymonth@gmail.com! Nebraska Archaeology Month aims to engage professional archaeologists and the citizens of Nebraska in activities showing the archaeological richness of our State in order to encourage a new generation of archaeologists and give citizens a greater appreciation of archaeological site stewardship. Nebraska is a special place and contains spectacular archaeological resources. Thank you for helping to share these resources and archaeology throughout the world! Last Friday, NAPA member and UNL Graduate Student Erin Carr presented her graduate research on the geophysical analysis of three Custer County sod house sites to community members and high school students in Broken Bow, Nebraska. The event was sponsored by the Custer County Historical Society and Museum with cooperation from Broken Bow Public Schools. Carr’s research, part of a larger Digital Homesteading preservation project led by Dr. LuAnn Wandsnider, involves the geophysical investigation of homestead sites in an attempt to relocate sod house footprints (in this instance, a footprint indicates the physical signature of a sod house that remains even if no visible evidence of the structure exists on the ground surface). 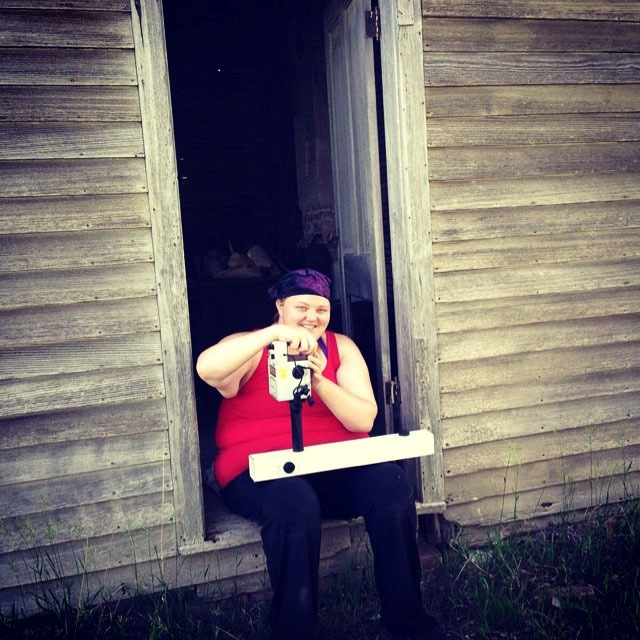 She has conducted gradiometry and resistivity surveys on sites of varying levels of disturbance, with the aim of establishing a standard for identifying sod house footprints in future surveys and research, as well as determining whether such footprints disappear from the material record with particular degrees of disturbance. Based on her findings to date, even with continuous disturbance of a site from agricultural activities, a footprint for the sod house structure can still be located using geophysical methods, indicating that such sites, albeit ephemeral, may still prove to yield information via archaeological research. Custer County residents are excited about the results of Carr’s research, and the larger digital preservation project, with their established connections to their homesteading heritage, particularly through the well known photographs of Custer County homesteads by Solomon Butcher. Fortunately, those interested in reading a final report on Carr’s findings will not have to wait long – her thesis research will be posted online following her defense, which she hopes to complete this December. Visit the Anthropology Department Theses page on digitalcommons.unl.edu for access to this thesis, and other recently completed theses, as they are posted.